Ahmad Bradshaw easily made my top 20 RB prospects for the RSP. His performance on an undermanned team against superior opposition transcended his stats. Photo by Ted Kerwin. One of the most frequent requests I’ve heard from readers over the years is to rank players at their position across several draft classes. It’s an entertaining thing to read, but I’ve always been reticent about doing it. There are a lot of approaches I could take with the ranking process and I’m not sure if any of them will feel good enough to stand behind. I could rank by checklist scores, but I don’t believe in ranking players solely by the quantitative criteria I used to derive a score in the Rookie Scouting Portfolio publication. This is only half of the analysis that I perform. The other half is providing a detailed context behind the scoring that often fills in the gaps that the data leaves behind. Even then, there is a factor I call “The Great Emotional Divide,” which separates productive NFL players from massively talented NFL prospects. Another valid question is whether I should judge these players based on what I’ve seen from them in the NFL. If so then am I doing justice to the rookies from the 2011 class? None of this makes me feel like I’m on solid ground. I don’t like rankings because they are highly fluid thoughts frozen during a brief period in time. Some readers may believe my business as author of the Rookie Scouting Portfolio is ranking players, but they’re mistaken. My primary goal with the RSP is to profile these players and analyze their games. The ranking is perhaps the least important part of the analysis. It’s the conversation starter. The attention-getter. The marketing schtick. It’s the cocktail party, three-sentence summation of a complex subject that you need to learn or you come across as rude or socially awkward. As much as I value Twitter for attracting readers like you to the work I do, I’m not much on cocktail party chatter. Nothing wrong with it if that’s your thing, it’s just not mine if I can avoid it. If the player stayed healthy. If a team drafted each player with the intent that he start. If the player could have made a successful emotional transition to the rigors of professional life. If the player addressed the deficiencies that I thought he was capable of addressing (regardless of whether he proved me right or wrong in that sense). The only hindsight analysis I will provide is for color or support, but it will not be the basis for my rankings. That’s my preamble to this series. Try to remember the gist of it as you read what I hope is entertaining for you, because that’s all it’s worth. Darren McFadden: In my RSP analysis I mentioned that he and UCF RB Kevin Smith had the best ability to turn their hips of the backs in that 2007 class. However I didn’t believe he had enough change of direction and vision to become an every down player. I was wrong. His ability to bend runs in a direction at top speed is unprecedented in the modern era and it’s this exceptional athletic ability that helped him transition to the NFL successfully thus far. Chris Johnson: I thought Johnson’s play at ECU was good enough that I could see the logic behind switching him from wide receiver to running back. I also believed it would take Johnson a few years to make a successful transition to the NFL as a runner because the holes at ECU were generally much bigger than what he’d see as a pro. I expected Johnson to develop into a runner with a game similar to Brian Westbrook. When at the top of his game, Johnson is a fantastic NFL running back. Arian Foster: I compared Foster to Eddie George after watching him as a junior. He scored an 86 on my checklist, which was in the range of scores that I gave to players like Matt Forte, Demarco Murray, Ahamd Bradshaw and Maurice Jones-Drew. In other words I thought what he did at that point in time was on par with a high-end committee runner with potential to develop into a full-time starter. Foster is a great example of a player that I think most scouts and personnel evaluators considered a physically talented underachiever that might not have a strong passion for the game. He’s proven otherwise. Addai's tough when he's on the field, but sometimes it's been tough to keep him there. 20. Joseph Addai, LSU – Daniel Thomas and Knowshon Moreno were very close to making the cut. However, Thomas was a strong athlete with potential to develop into a feature back and Moreno was a more conceptually gifted runner in terms of vision, but what put Addai on this list was his versatility at LSU. He was the type of player that did the little things on drives that made a big difference. 2006 RSP Quote: After Reggie Bush, this is the back from the draft class of 2006 that I’d want to have on my football team. He plays with heart, toughness, and brains. He does everything well, and well enough to win games. He is a physical runner with excellent wiggle. Addai is as solid an all-around back as there is in college football today. He’s going to be a good NFL back, because he can catch and block very well. Some team is going to be thrilled Joseph Addai fell to them. Addai had been banged up enough that in hindsight I could have had more leery of his ability to stay healthy in the NFL. However, Terrell Davis was incorrectly characterized as soft and until his knee wore out he was a great NFL runner. The Colts runner has been quality starter for three of his five years and he played at least 13 games in each. However Addai has been characterized as a slow healer with even minor injuries. None of this factors into where I ranked Addai when I watched him at LSU. When Indianapolis took Addai it struck me as a logical choice. He never had elite athleticism, but his all-around game was about as solid as one could hope for. 19. Rashard Mendenhall, Illinois – A lot of people were enamored with Mendenhall because at Illinois they saw a big back with speed. Mendenhall’s ability to catch the ball and his build-up speed, which we saw on display against USC’s talent-laden defense in the Rose Bowl ignited his stock. My concerns began with his conceptual approach to the position. 2007 RSP Quote: Mendenhall is not an aggressive downfield blocker or run blocker. He often misjudges opportunities to make a play without the ball in his hands. He needs to learn to press the hole more effectively and he misses some larger openings in the hole. If he can become a better pass blocker and improve his understanding of blocking schemes and make better decisions off this knowledge he could become a reliable starter on an NFL team. Mendenhall had more big-play ability than Addai and he had the potential to develop into as good of a receiver. In hindsight, Mendenhall struggled to transition to a feature back. I think he’s tried to make up for some of his issues setting up creases with a spin move to get out of trouble when he wasn’t as patient to hole as he could have and the Steelers haven’t been consistently pleased with his pass protection and short-yardage skills. Nitpicking aside, Mendenhall has been an effective runner with big-play ability. I felt like Illinois’ system showcased Mendenhall and his potential grew on me as his junior year unfolded. I liked Mendenhall but I saw a potential starter, not a perennial Pro Bowl player. 18. Mikel Leshoure, Illinois – Leshoure and Mendenhall were very similar backs in terms of dimension and style. Like Mendenhall, Leshoure was a nightmare to stop in the second and third level of a defense. However, Leshoure had a little more agility and he demonstrated better vision between the tackles. What I thought he did best as a runner was run with patience behind his linemen and there were encouraging signs that he was learning to effectively press a crease and burst through it. Yet, he was a liability in pass protection despite possessing the physical skills to develop into a good blocker. 2011 RSP Quote: Leshoure has agility and some shiftiness to setup angles, but he lacks dynamic change of direction skills. I did not see him break a tackle in his first three quarters of carries in this game. In fact, I saw him consistently wrapped up after first contact, which belies what you would expect from a player of his size. When he’s forced to go east west early in a run, he’s far less effective – as most backs of his size-style are. He isn’t used to making mature decisions against faster defenses that force him not to look for that second option behind the line of scrimmage. It’s a shame that Leshoure tore his Achilles tendon during his rookie training camp because he had a chance to develop into a productive complement to teammate Jahvid Best. If he were willing to work hard at the game I think he could have become a three-down back. Now the first priority is to determine if he can recover enough of his athleticism to play running back at the NFL level. 17. Kevin Smith, UCF – Smith had a lot of small deficiencies in his game that kept him from being an elite prospect in my eyes. He wasn’t a great yards after contact runner and he didn’t have the feet to vary his stride length to get yardage in tight quarters that was available. His receiving skills were okay for a college player, but he needed to learn to catch the football with his hands away from his body. Despite these issues, I thought Smith had a shot at elite upside. 2007 RSP Quote: Smith’s hip movement is rare for a runner. He can change directions at full speed because he can shift his hips with a very quick, snapping movement. He also can make sharp lateral cuts, jump cuts, and spin moves. He often strings together two moves to set up and kill the angle of a defender in the open field. His gliding, flexible, and hard-cutting style and his ability to reverse field is reminiscent of Marcus Allen and O.J. Simpson. He looks skinny for 211 pounds and it looks clear that he could gain another 10 pounds and still retain his speed as he continues to develop as a man. He runs with good pad level, body lean after the hit, and has excellent vision in traffic, behind the line of scrimmage, and around the corner. One of the greatest concerns I had for Smith was this hard-cutting style and the potential for a career-altering injury to his legs. Although Smith’s career has been riddled with injuries, there’s no scientific evidence that I know of that shows a correlation between a hard-cutting style and short career span for a runner so my fleeting worry didn’t stop me from thinking Smith was a prospect capable of growing into player with high-end NFL productivity. I actually thought Smith would have had the type of production we’ve begun to see from Darren McFadden. Smith is the first of the next five backs on this list that I believed flashed lead-back ability in the NFL but the biggest question I had was whether NFL teams regarded them as highly as I did. 16. Ahmad Bradshaw, Marshall – Bradshaw was one of those players that electrified me the moment I saw him. Interestingly enough that moment was a 24-carry, 72-yard performance against a highly ranked Tennessee Volunteer defense. It may seem strange on the surface, but I find it easier to tell that a college runner has NFL skill when I see his team against a vastly superior opponent and that runner still makes those defenders work hard to bring him to the ground. 2007 RSP Quote: This was an impressive performance for Bradshaw (vs. Tennessee), who demonstrated unequivocally that his a tough, physical back that can carry the load and get the difficult yardage as well as break the play outside or beat defenders in the open field with his moves and quickness. 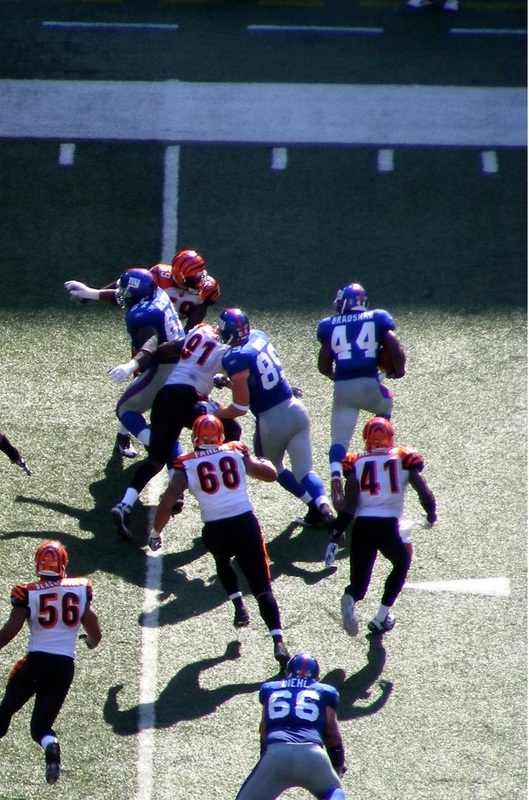 Bradshaw rarely went down on the first hit unless the defender delivered a perfect form tackle. I was really impressed with how low he can run in short yardage situations to earn 2-3 tough yards against stacked defensive fronts. 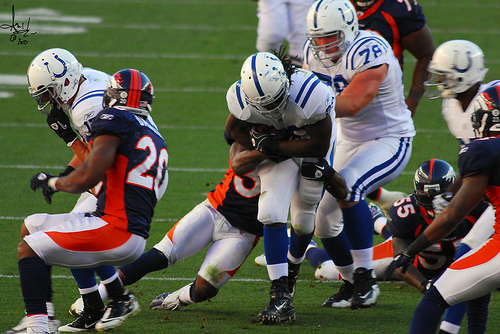 Opponents repeatedly bounced off Bradshaw in this game (he broke 10 tackles). This was one of the more impressive efforts I saw from a running back all year. Some might have found it strange that I described a 5’11”, 192-pound back like Bradshaw as physical but based on what I saw in games I’d rather have Bradshaw in short yardage than Mendenhall or Leshoure. Bradshaw has slippery power. His quickness smaller frame actually works to his advantage when it comes to preventing defenders from getting a direct angle. My greatest concern with Bradshaw was an ankle injury that plagued him in college and ultimately continued to be an issue for him until he had offseason surgery in 2010 to correct it. He slipped in the draft because of this ankle problem, his size, and most of all, character concerns stemming from a theft of a video game unit in the dorms. When it came to what he did on the field his decision-making, footwork, and quickness were fantastic and I thought he had a very good opportunity to become an impact player. I think the Miami Dolphins, Cincinnati Bengals, and Denver Broncos made a huge mistake not to acquire Bradshaw in free agency this summer. However, NFL personnel still have biases about runners of smaller stature. 15. 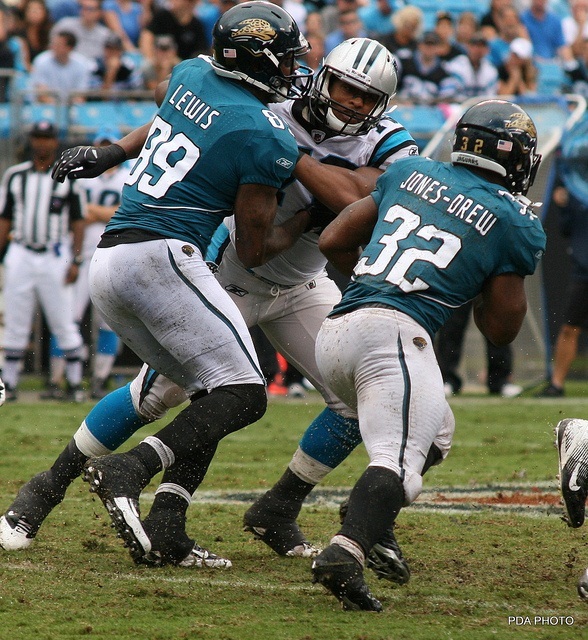 Maurice Jones-Drew, UCLA – One of the comments I made about Jones-Drew in the 2006 RSP was that if he were 5’10” and 217 he’d give Reggie Bush a run for his money as a top-five pick. Unfortunately his 5’6″ height was a question mark. You have to remember that Warrick Dunn was the exception to the rule in the NFL and Darren Sproles was an obvious talent, but he wasn’t earning lead-back chances. The ultimate difference was Jones-Drews’ thick, muscular frame that packed over 210 pounds by the time he transitioned to the NFL. Those extra four inches didn’t matter and in fact the lack of them proved to be an asset. You try stopping a bowling ball moving at high speed. 2006 RSP Quote: Drew’s height and weight will have many people skeptical about his every down potential. His level of talent outweighs his draft position due to this fact…He may be small, but he’s a back you must wrap up when attempting to tackle because he has excellent balance and a low center of gravity. Drew is a fine receiver from the backfield and very dangerous in the open field. This is a great football player in a small body. He should make an impact in the NFL for many years as a multidimensional threat from the backfield. If there is a player that can be the next Warrick Dunn, Drew has the best chance to do it. The reason I have Jones-Drew so low on this list is that I was skeptical an NFL team was going to give Jones-Drew the chance to earn more than 100-150 touches per season. I also wondered if he could break tackles, punish defenders, and perform in pass protection at an acceptable level. If I were to incorporate hindsight analysis in my rankings Jones-Drew would have been on a top-five prospect. Even in 2006 I said he was a great football player and I don’t think there are many times I have used the word “great,” to describe a college running back in well over 500 film evaluations of the position. In fact, if I were an NFL GM and I could have an RB from this list in his prime my No.1 player would still probably win it, but Jones-Drew would give him a serious run for his money. 14. Bilal Powell, Louisville – The only difference between Powell and Demarco Murray – the player I have ranked one spot ahead of him – is that Powell lacks the proven starting experience, proven ability to play hurt, and proven versatility of Murray. I had Powell ranked one spot higher than Murray in the 2011 RSP because of Murray’s injury history, but as a pure talent Murray gets the nod. Obviously, the fact that Powell and Murray are on this top-20 list should indicate how much I liked both of them as prospects. I think Powell is actually a better between the tackles runner than Murray. 2011 RSP Quote: Powell is a really good downhill runner with patience and the ability to set up blocks by pressing the hole and making a sharp cutback. Just watch him run for any length of time and you’ll see that he enjoys finishing runs as the aggressor. He knows how to get his pads low so he can come under a defender, deliver a hit and keep his legs moving to get yards after contact. He runs with the attitude of a 220-lbs. back with speed even though he’ll probably need to gain 10-15 pounds to be at that playing weight. What really impressed me in this game was his ability to process what the defense was doing successfully on a play in the first quarter and then make a decision at the line of scrimmage to turn that against them for a big play in his favor in the second quarter. It’s a sign of not only an instinctive runner, but also an intelligent one. He consistently gains yards after contact, whether he’s wrapped from behind or hit head-on. A part of his game that isn’t talked about a lot is his feet. He can maneuver tight spaces with good footwork to make defenders miss his feet. The reasons Powell slipped to the fourth round was his lack of starting experience at Louisville, the fact he needs to add 10-15 pounds of muscle to get into that 220-lb. range, and he wasn’t used a lot on third down. 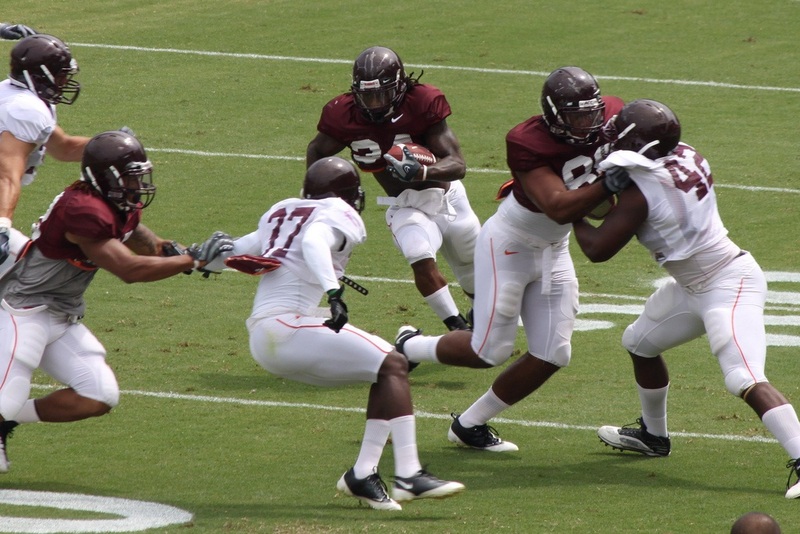 I expect Powell to earn playing time in 2012 and seriously challenge Shonn Greene for the lead role if he stays healthy. 13. Demarco Murray, Oklahoma – When Murray burst onto the college football scene as a freshman it appeared as if he might succeed Adrian Peterson as the next great OU tailback. He was a dynamic, game-breaking runner with excellent skills as a special teams returner. But the injuries piled up and his trajectory toward stardom seemed to tail off. However, I think those injuries actually helped Murray become a more disciplined runner between the tackles and develop a more decisive and determined style that most runners of his physical ability have to address during their first couple of years in the pros. LeSean McCoy, Jamaal Charles, and C.J. Spiller are three runners that encountered an initial adjustment period in the pros because they were used to successfully bouncing runs outside and reversing field in college football and these choices were failing them in the NFL. 2011 RSP Quote: Murray has all the tools to be a starting NFL runner. He has the burst and speed to get the corner or hit a hole and wreak havoc in the second and third level of a defense. He can string together moves in the open field, but he has learned how to judge when it attempt a cutback and when to lower the pads and push the defense backwards. His pad level is often very good and it routinely helps him get yards after contact. He’s a highly versatile player that pass protects and catches the ball like an NFL third down back. He rarely misses assignments and he delivers a good pop as a stand up blocker. OU trusts Murray as a receiver enough to split him wide and throw him the ball on routes longer than 10 yards and he usually catches the football without a problem. If he can stay healthy, Murray can be a Tiki Barber like player with more power. Murray’s 25-carry, 253-yard debut as a starter isn’t the type of production anyone should count on him sustaining, but I wouldn’t be surprised if he overtakes Felix Jones as lead back heading into 2012, if not by the end of 2011. He’s not as flashy as Jones, but few players are. Then again, Murray is just as versatile and his work had more consistent substance. What I admired most was the fact that Murray frequently played and played well when he wasn’t 100 percent. That’s a sign of back capable of becoming a productive NFL feature back. Frank Gore, Ray Rice, and Maurice Jones-Drew are all backs that demonstrated this skill that Murray shares with them. What impressed me the most was that when OU needed a play or a series of plays at an important part of the game, it was Murray they leaned on – healthy or hurt – and Murray frequently came through. If Walter Payton and Cadillac Williams were on the upper end of a continuum of runners with agility, balance, vision, and effort Williams has the potential to fall between them if he overcomes a tendon injury. Photo by Gary Cope. 2011 RSP Quote: Williams occasionally has lapses of maturity with his decision-making at the line of scrimmage, because he tries to go for the homerun cut or reversal of field. His pass protection needs work. He has slippery power and determination, but his size precludes him from being a naturally punishing back and there is some concern if he runs with a similar punishing style as a Cadillac Williams that he could wear down. Williams unfortunately suffered the same injury that plagued Cadillac Williams twice during his NFL career. Hopefully the rookie can make a full recovery and recover the athleticism that made him a prospect with feature-caliber potential. If I were to place him on a spectrum of players with similar style and talent he had the potential to fall in a space ahead of Cadillac at his best and a notch or two behind Walter Payton. 11. Jahvid Best, California – The head injuries are a major concern for Best as a pro and I underestimated the effect this would have on him as a prospect. In terms of pure ability, Best has the potential to develop into the back that might have rivaled Thurman Thomas and Marshall Faulk in terms of versatile, feature back skill. 2010 RSP Quote: What Best does as well as any back I have seen this year is run in tight spaces. He has patience and presses even smaller holes to set up blockers. He might have better patience than any back I have watched this year. He also does a great job of pressing the hole and finding the cutback. When in the open field, he not only has speed, but the agility to string two or three moves together within a short space to create additional space. Although he did not catch a pass in this game, he was the first back since Chuck Muncie to lead Cal in rushing and receiving and he catches the ball very well.His ability to run with agility, speed, and patience with good decision making not only where the run but how fast, makes him the most dangerous back in this draft. I had concerns that Best might not be able to push a pile or break tackles effectively in the NFL, but I anticipated the runner would gain additional “man weight” and he’d at least have reasonable power for a smaller back. This hasn’t happened yet and with the concussion issues it’s questionable he’ll ever earn break past the Reggie Bush role in an offensive system. Part II will feature my top 10. I noticed in your 2011 RSP you ranked Powell ahead of Murray but on this list it’s the other way around. Are those rankings on different criteria? Aaron – It’s explained in the blog post. Busted! You caught me skipping to the player rankings. Thanks Matt. Cool retrospective. Looking forward to the top 10.